Well well. Here's a funny little wargames-style story of unexpected consequences. A few months ago, I was gifted a whole stack of old wargames magazines. 'Gifted' would be a term challenged by my dear wife - 'burdened' might be her preferred word. But she just doesn't understand the way the mind of a dedicated nerd works. For example, she recently suggested that the best way to solve the problem of disappearing shelf space was to dispose of one of my current military history books whenever a new one was bought! Where do women get these ridiculous ideas from? The concept that I had been patiently and assiduously creating a library of reference works over the last 30 years seemed entirely alien to her. Anyhow, I have been reading through these old mags and binning those with nothing of current interest, which meant about 70% of them going into the re-cycling. 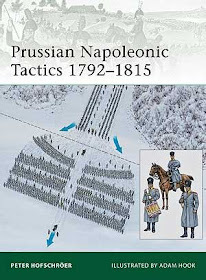 On the plus side, I have been surprised by a number of thought-provoking articles and some interesting scenario ideas. This particular story, however, starts with an advert in a 2003 issue of Wargames Illustrated. This featured a company called HCH Figures, a UK trader who were offering painted wargames figures in association with Tin Soldier UK. Buying wargames figures ready-painted has mostly been my preferred method of building an army over the years, a method I am usually prevented from using by financial constraints. Surely HCH would be out of business by now? Not so. The business seems to be thriving, and I was about to find out why. Cruising the HCH website quickly established that, mostly, my aforesaid financial constraints still applied, but there were a couple of areas where I was tempted - chariots and elephants. 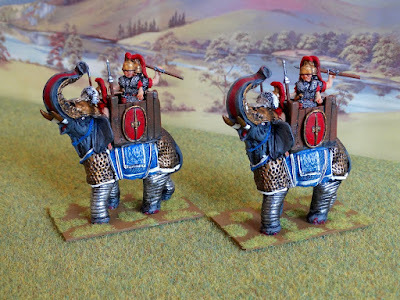 I am currently eagerly awaiting the plastic elephants promised by Victrix, and nervously girding myself for an expensive purchase of some Hittite heavy chariots from Warlord Games. So I was in the market for resolving one of these problems. The heavy chariots available didn't quite fit the bill, but there were some rather nice looking elephants. 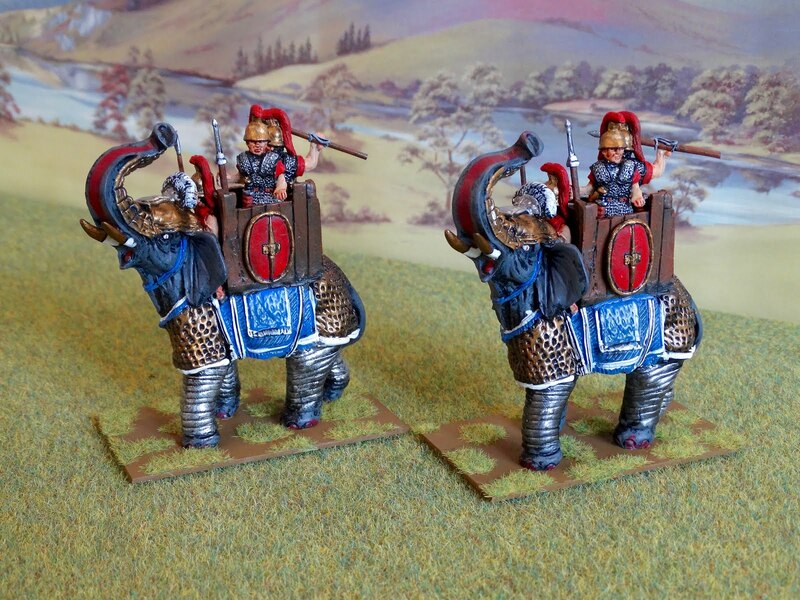 And what was this - the armoured 'Successor' elephants were currently a sale item at £22 each. I was a bit concerned that the range of figures was described on the Tin Soldier website as 25mm. Being an obviously well established range of figures (a polite way of saying they looked a bit old-fashioned), I thought they might be undersized in relation to modern 28mm plastic and metal figures. But if I was buying elephants, that sort of thing probably wouldn't notice, would it? 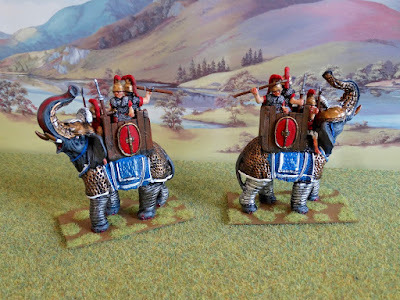 So I closed down the website, took the dog for a walk to give myself a chance to re-consider, and on my return ordered two of the fully painted Successor elephants (code SUC8). Total £44 plus a very competitive £2.90 for postage. Just 2 days later the parcel arrived. Two days - that's Amazon speed for £2.90 postage. Warlord Games take note (£5 postage and 4-5 days to arrive if you're lucky). And I was bowled over by the elephants themselves. Firstly, they were beautifully packed, with the three figures, javelins and pila for each one included separately (individually wrapped in tissue paper, no less). And the quality of painting was very good, as far as I was concerned. Plus, the figures do match the proportions of other current ranges, as in fact promised on the HCH 'About Us' page. Assembly was a pleasure (the figure bases need to be filed flatter to get a good 'fix', but otherwise everything fits neatly). 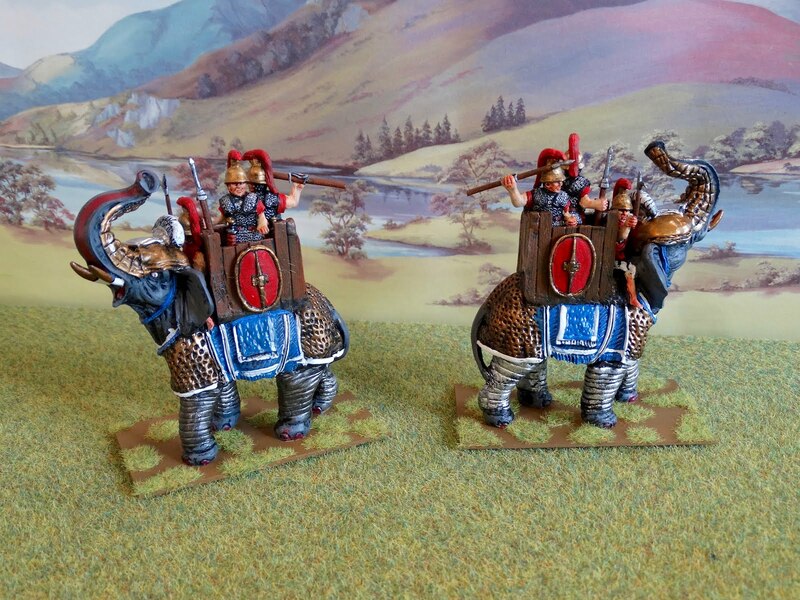 A quick basing job and there I was - the proud owner of a pair of great-looking model elephants. I had a happy grin on my face for quite a while. I think the pictures say everything about these fine products. I find them thoroughly contemporary, with a charming hint of Old School in the posing and general look. Not being used to such happy outcomes, I checked the Hinds Figures website, to find that even elephants much more expensive than the ones from HCH didn't look as good. And the cheaper ones from Hinds looked positively sad. There we are then - more units added to my Ancient armies for no effort and a very reasonable monetary outlay. Result! Even more so for being unexpected and unintended. Stay tuned for a forthcoming report of another cracking Old School game with Stuart Asquith. See you then. "A tide taken at the flood"
Wonderful job, these elephants are very impressive! Excellent figs. I thought HCH was long gone. Thanks for the tip! I must say the elephants and crew do look rather splendid and at a great price to boot. Definitely looking forward to the AAR of your latest game with Stuart. I need to get some wooden bookcases myself; most of my library is currently languishing in moving boxes. So far I have only found either cheap particle board bookcases, which I don't want, or expensive fancy wood bookcases, which I don't need/don't want to pay for, or some wooden ones which are decent enough and cheap enough but too small (but I did get a couple of those anyway for places where the taller bookcases I really want wouldn't fit). I'm starting to think that getting a few tools and making some very basic bookcases myself might be the way to go. Sounds like you got a good deal on some quality pachyderms. Fitz-Badger: all of my bookcases came from Ikea. Inexpensive and they don't look too bad. Thanks, Keith. Most of the Ikea bookcases seem to be made of particle board. They do show one line that is made of pine (the Hemnes), but they also say it's not in stock. I would get a few of those if I could. But I don't want to wait forever. Ah yes - if you want solid wood that can get expensive. Making your own sounds a reasonable option if you have the time and skill.